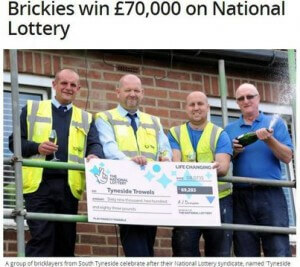 A syndicate composed of seven bricklayers have just matched five numbers in the July 8th draw of the National Lottery. Now the group who call themselves the Tyneside Trowels will share a £69,283 prize. The syndicate have been playing the same nine lines every Wednesday and Saturday for the last 20 years. Only three or four of the members have been in since they started. The members of the group are elated, even though they have not won enough to retire on. Plans for their windfall include trips, kitchen renovations and a fancy guitar.